Cables for several output types including variable reluctance, open collector, single ended, differential line driver with or without index are available. Encoder cables and mating connectors with cable clamps. Shielded for protection against noise and interference. 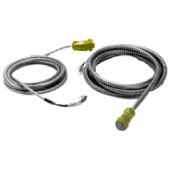 Encoder cables available in 5 foot increments for custom order. Cables and connectors can be ordered separately or combined.